Morgan has been accused of ‘hate-mongering’ following the interview. 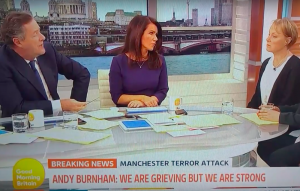 Good Morning Britain viewers took to Twitter to criticise Piers Morgan after he gave a “sickening” interview about last night’s Manchester attack. Coronation Street actresses Sally Dynevor and Connie Hyde had been booked on the ITV breakfast show to talk about their latest storyline on the soap, but following last night’s terrorist attack after an Ariana Grande concert, the conversation inevitably turned to events in Manchester. “At some point there has to be a more concerted effort by the Muslim community to root out these people whose brains have been completely warped into thinking that this is the way they should be behaving,” Morgan told his guests, who appeared uncomfortable with his argument. On Twitter, viewers called Morgan’s approach to the interview “irresponsible” and “sickening”, and accused him of hate-mongering. How is Piers Morgan a new presenter?? Honestly, seriously! Stop putting words in people’s mouths, spreading hate and making assumptions!!! Piers Morgan should not allowed to be on TV – responding with hate and spreading fear is completely irresponsible. Love wins every time. The post Viewers criticise Piers Morgan’s ‘sickening’ Manchester attack interview appeared first on NME.